Instructions ~ Combine dry ingredients in a sauce pan. Add the water and oil. Stir together and heat slowly over low heat. Stir almost constantly until the play dough sets up. Let it cool to warm before playing, play dough right off the stove is hot. 5 to 6 drops any combination of cocoa absolute and sweet orange essential oils, if desired. Instructions ~ Follow the instructions above for making rose play dough. Double, triple or quadruple these recipes if making play dough for a large group. Make little "treats" for your child to hand out at school. Wrap a small ball (or make into little hearts) of each kind of play dough in a plastic bag, tie with a lovely ribbon and add a little heart-felt note to complete the Valentine. Makes a wonderful substitute for the sugary candy treats normally handed out this time of year. Take a nice big batch of each play dough into your child's school or to a playdate and let the kids enjoy. 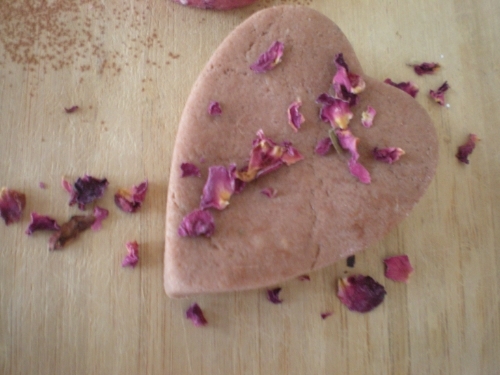 Supply baby rose buds, cinnamon sticks, glitter and heart cookie cutters to enhance play. 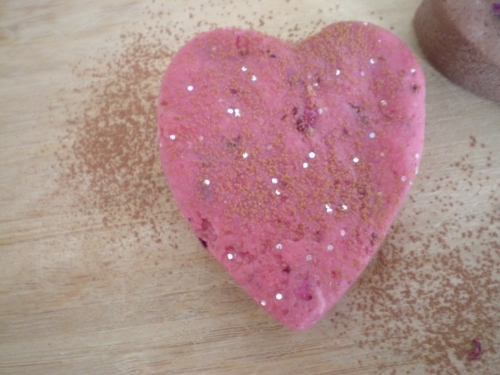 Give a batch to your little one on Valentine's Day, makes a great present.